Former Gov. Rick Perry and U.S. Sen. Ted Cruz made their presidential cases to the heavyweights of Iowa agriculture Saturday, and each made no apologies for opposing one of the state's favorite programs. 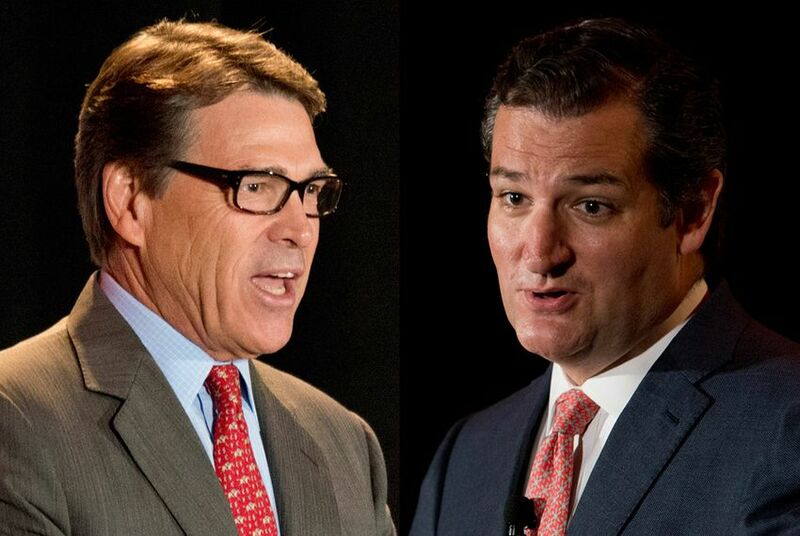 DES MOINES, Iowa — Ted Cruz and Rick Perry brought their presidential pitches before Iowa agriculture heavyweights Saturday, casting themselves as fierce opponents of federal involvement in the farm economy at the core of the key presidential primary state. Their messages at the Iowa Ag Summit were occasionally at odds with what some members of the audience wanted to hear -- a fact both acknowledged to varying degrees during 20-minute onstage interviews with Iowa ethanol mogul Bruce Rastetter. Cruz was the most blunt when Rastetter asked him about the Renewable Fuel Standard, which sets a minimum amount of biofuels that must be blended into the gasoline supply. "I recognize that this is a gathering of a lot of folks where the answer you'd like to me to give is, 'I'm for the RFS,'" the Republican U.S. senator told Rastetter. "That'd be a pretty easy thing to do." But Cruz, who has called for phasing out the RFS program over five years, said Americans are fed up with "career politicians" who pander to voters, especially in places like Iowa, with its outsized role in the presidential nominating process. Perry was equally unapologetic for his opposition to the RFS, saying he had no regrets about unsuccessfully seeking a federal waiver from the mandate as governor during a corn-sapping drought a few years ago in Texas. He used the issue to press his allegiance to the Tenth Amendment, saying states, not the federal government, should be allowed to craft energy policy suited to their unique needs. The Texans used almost identical language to describe their opposition to the RFS, saying it amounts to the government "picking winners and losers." During his conversation with Rastetter, Cruz extended the criticism to the federal wind tax credit, likening it to the "corporate welfare" he has long opposed out of principle. The Texans' positions invited the ire of America's Renewable Future, a pro-RFS group and top sponsor of the summit. In a news release, the organization pointedly contrasted Cruz and Perry with "leading candidates" who spoke before them and support the RFS. "It is clear that Senator Cruz and Governor Perry need to learn more about this crucial issue," co-chair Bill Couser said in a statement. Perry nonetheless positioned himself as having the most extensive agricultural resume of the 2016 presidential bunch, spending the first few minutes of his conversation with Rastetter ticking off his qualifications: son of a cotton farmer who grew up on a west Texas ranch, former state representative for several rural counties and ex-agriculture commissioner. "I think those of you in the agricultural community will respect that I know where you’ve come from, what you’ve been through," Perry said. "Somebody who understands the industry would be good to have in the White House." The Q-and-As between the Texans unfolded inside a climate-controlled building on the Iowa State Fairgrounds. Not far from the stage sat a large Sinclair tractor, one of several reminders throughout the day of Big Agriculture's investment in the forum. Opening the event Saturday morning, Iowa Gov. Terry Branstad borrowed a phrase well-known in Texas while listing the Hawkeye State's agricultural priorities: "First, don't mess with the RFS!" "What ethanol wants is fair access to the marketplace that Big Oil wants to prevent," Branstad continued. "We can’t let them have their way." Both Texans have tacked other events on to their trips to Iowa for the summit. Perry held a meet-and-greet Friday night at a roadside diner in Webster City, while Cruz was scheduled to tour the Iowa Deer Classic trade show Saturday afternoon in downtown Des Moines. The senator is staying through the weekend to address a gathering of pastors Monday afternoon, also in Des Moines. Asked after his speech whether there is enough room for two Texans in Iowa, Cruz stuck with the message of the day. "Iowa is a great, big, wide open farm state," he told reporters.